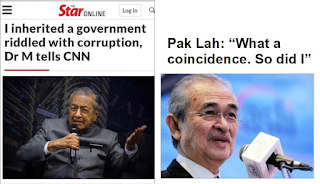 27/7 2018: Having sacked thousands of so-called political appointees in the public sector, including heads of government-linked companies, Prime Minister Mahathir Mohamad said he "inherited a government lousy with corruption and with few trustworthy officials". He announced to the world: "Most of the top echelons in the government are corrupt". Those fellas at the CNN may find this a brutally frank and, perhaps, refreshing, admission from the leader of a Third World country. But we have heard this before. Quite often, too, especially towards the end of Dr M's original tenure as PM (1981-2003). Once, when asked why he chose to retain some blatantly corrupt politicians as his Ministers, Mahathir quipped: "If I were to take action against them for corruption, I won't have a Cabinet left!" We never failed to laugh at his witty response. It is funny, isn't it? Your title is misleading. Dr Mahathir mentioned the top officials in the government department being corrupted...not his cabinet. Do you feel proud misleading the public just so to badmouth the present government? perhaps yes. at least finally, albeit not too late, there is a glimmer of hope, or shall i say, a slighter better future than not doing anything about the rot at all. in this instance, it is due time if we are ever going to get out of the corrupt culture, whether inherited, spun out of, created by, etc, etc. are you actually suggesting that such statement denote representation of guilt or a manupulative narrative to be sensationalised to gain mileage? or your part or in proxy? Let's compare the corruption during "Lanun Bugis" era? Do you wanna bet rocky?